On the one hand, we have organisations like the Department of Kannada and culture, promoting the use of Kannada, and trying to avoid its being interspersed with words from other languages. On the other, we have the everyday Kannada language, a vibrant and constantly evolving means of communication. 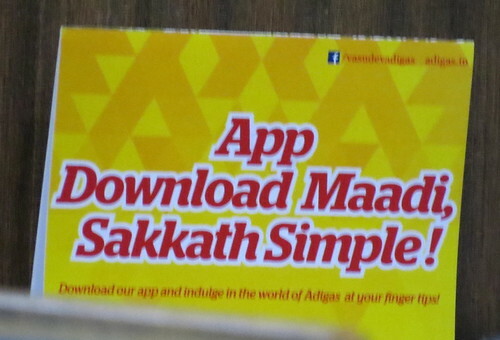 However, one wonders if it is Kannada at all, sometimes… here’s a message I saw in Adiga’s on Kanakapura Road. Only two of the words in this message are Kannada? It made me laugh!